Item: The loaded ACC will place all six lacrosse teams in the NCAA Tournament after a stellar; four games in three days at suburban Philadelphia saw the lower-seeded team win each time out. With that statement to begin his postgame remarks to the media Sunday afternoon, Syracuse lacrosse coach John Desko summed up perfectly, and put a light spin on, his team’s thwarted comeback in the final minute of regulation play ending with a 15-14 loss to Notre Dame in the ACC championship game at PPL Park just down I-95 from Philadelphia. First, it was a Friday night semi-final doubleheader that saw SU edge Duke 16-15 in the final fractions of a second, adding a chapter to great comebacks in the program’s modern era, and Notre Dame followed by taking its only lead of the game with 6.5 seconds to play in dispatching No. 1 seed Maryland, just six days after losing to the Terps 12-8 in South Bend. 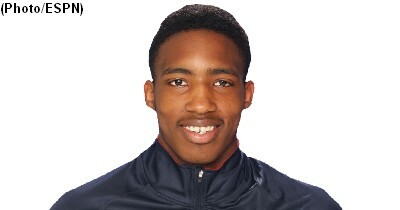 Even the bottom seed Virginia got into the fun edging arch-rival North Carolina 13-11 in the “Showcase” game Saturday night, avenging a one goal loss at Chapel Hill three weeks earlier. 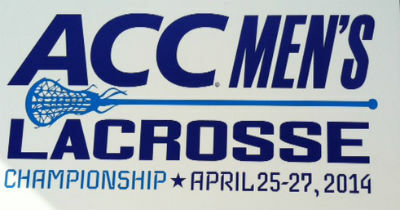 In each game of its debut ACC tournament, the Orange fell behind and rallied furiously in the fourth quarter, received eye-opening scoring from big guns Kevin Rice and Randy Staats, up and down goalie play in reverse order in both games from Dom Lamolinara and Bobby Wardwell, and sold contributions from the starting defense and both top midfield units, again, considering the top-flight completion. As down as the Syracuse players were after finally losing in a conference tournament setting when splendid attackman Rice (15 points in the tourney) was stopped in front of the net in the final seconds, and thus unable to duplicate his heroics of scoring the game winner during SU’s 11-10 win over ND in the Dome March 29, speaking for his teammates, Rice looked forward to a lot of lacrosse left to be played. “Anytime you lose a game it’s a kick in the back,” Rice said after the Orange dropped to 10-4 with all of the defeats coming in ACC play. 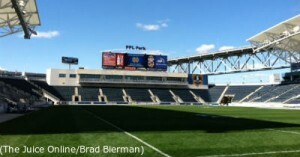 The average announced attendance for the two tournament days was 4,344 at PPL Park, and the venue which is the perfect fit from a logistical standpoint, if not geographical (abandoned industrial neighborhoods on three sides and the Delaware River on the other), will again play host to the ACC tournament in 2015, although the No. 5 vs. No. 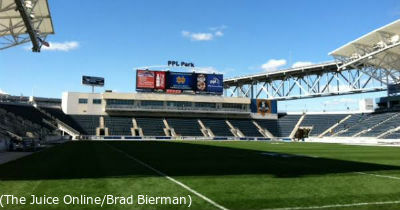 6 “Showcase” game will likely be moved to the University of Pennsylvania campus.